With its Alice sequel currently on hold, Spicy Horse has pitched a Robert Heinlein-inspired Wizard of Oz to fans. Last month, American McGee stated that if his planned Alice sequel couldn't be made, than Spicy Horse would try its hand at a Wizard of Oz game. It looks like Alice fans will have to wait a bit longer after all, as McGee has finally launched his OZombie Kickstarter project. The veteran developer is asking for $950,000 to create an open-world, primarily single-player action-adventure game that draws from all of L. Frank Baum's Oz books. (Except for the parts with zombies; I'm pretty sure that's all McGee.) 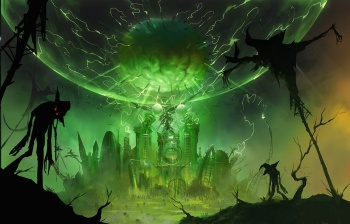 While zombies and literary steampunk reimaginings are old hat, McGee has promised a unique take on the material that will redefine Oz for a new generation. For example, it sounds like this new interpretation will be heavily influenced by the work of Robert Heinlein. "As a kid I was a huge fan of Robert Heinlein's stories," McGee writes. "There are several 'Heinlein themes' that I like and want to explore: Individual liberty and self-reliance, the obligation individuals owe to their societies (and vice versa), the influence of organized religion on society - and the tendency of society to repress nonconformist thought." OZombie begins with Dorthy's return to Oz, where she discovers that the Scarecrow, gone mad with brains, has unleashed Ozombies that corrupt the natural environment. Dorthy and her companions must set out on a quest not merely to stop the Scarecrow, but to restore the balance and harmony that was disrupted in the attack. "Killing [Scarecrow] is neither victory nor resolution," Mcgee explains. "Dorothy will have to do much more -- build communities and persuade allies to root out and destroy the damage to multiple cultural and political institutions to restore a humanistic civilization." Sounds like the Lollipop Guild has its work cut out for it. OZombie's single-player campaign will focus on "role-playing, tactical combat, exploration and storytelling", but will also feature unlockable multiplayer elements like raids and tournaments. The Kickstarter lists PC, Mac, Linux, iOS, and Android as OZombie's currently supported platforms.